For two sworn enemies, anything can happen during the Hawaiian trip of a lifetime--maybe even love--in this romantic comedy from the New York Times bestselling authors of Roomies. Olive Torres is used to being the unlucky twin: from inexplicable mishaps to a recent layoff, her life seems to be almost comically jinxed. By contrast, her sister Ami is an eternal champion . . . she even managed to finance her entire wedding by winning a slew of contests. Unfortunately for Olive, the only thing worse than constant bad luck is having to spend the wedding day with the best man (and her nemesis), Ethan Thomas. Olive braces herself for wedding hell, determined to put on a brave face, but when the entire wedding party gets food poisoning, the only people who aren't affected are Olive and Ethan. Suddenly there's a free honeymoon up for grabs, and Olive will be damned if Ethan gets to enjoy paradise solo. Agreeing to a temporary truce, the pair head for Maui. After all, ten days of bliss is worth having to assume the role of loving newlyweds, right? But the weird thing is . . . Olive doesn't mind playing pretend. In fact, the more she pretends to be the luckiest woman alive, the more it feels like she might be. 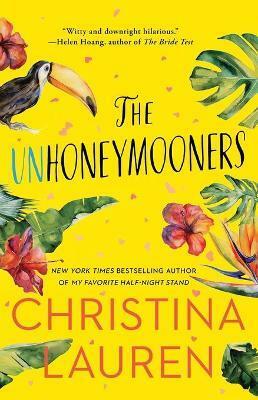 With Christina Lauren's "uniquely hilarious and touching voice" (Entertainment Weekly), The Unhoneymooners is a romance for anyone who has ever felt unlucky in love.